No class on either Friday 28th December or Friday 4th January. Classes resume Friday 11th January. The eighth in our series of arts evenings, bringing 'uncut performance gems' (ours and others') into the spotlight. See 'new work' for more general information about Diamond Nights. ...from central Oxford, follow High Street over the river to the roundabout at The Plain, take first exit (St Clements) and continue past traffic lights and straight on up Headington Hill, past the park, and then take the first driveway to the left near the top of the hill. Go past the gatehouse and take the 2nd turning on the right. The Drama Studio is a smallish, squarish building with railings outside the door, set back from the main driveway. Last time I checked, parking was still unrestricted on Saturday evenings. ...from London, buses go every ten minutes and run all night. Catch either the Oxford Tube, or the Oxford Express, then ask the driver to drop you at the stop called 'Gyspy Lane' or 'Brookes University'. Get off the bus and CROSS THE ROAD. There are two campuses, and the one you want is the less obvious one, a few metres further down the hill and on the other side of the road. Cost: £60 for the weekend. Times: 10.30 - 4.30 on both days. Yael routinely manages to get performers to go beyond what they had thought themselves capable of, assisting them to generate authentic performance material from their own inner resources. A remarkable teacher. This is the third workshop of Yael's that Cafe Reason has hosted in as many years. Very highly recommended. Participants often find that Yael's interventions will 'unblock' their creativity and launch them on a new and fruitful phase in their lives as artists. 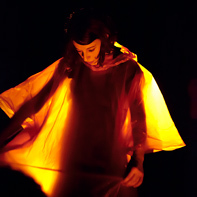 Although Yael does have a significant background in butoh her work is more geared towards physical theatre. Yael has been invited primarily for the benefit of Cafe Reason members but there is also a limited number of places available to anyone else who would like to take part. Suitable for those with a background in dance, choreography, theatre and so on. Please contact Ana Barbour for more details. In this workshop we will explore the relationship betwen sound and movement within the context of Butoh dance. We will look at some of the issues musicians are faced with when creating music for Butoh, and also at how the dancers themselves might create their own musical accompaniment. We will look at how natural sounds and the voice might be incorporated into a soundscape together with musical instruments, and we will explore ways of moving within those soundscapes. The workshop is open to both dancers and musicians. No particular level of music or dance experience is necessary. If you already play a musical instrument that is fine, but it is also open to those with little or no practical experience of music-making. Dancers of all levels of experience are very welcome, including those new to Butoh. 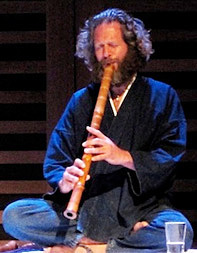 Adrian will bring his own collection of beautiful musical instruments from around the world. Participants can also bring their own instruments if they wish, plus any 'sound objects' they like, which may be as simple as pieces wood, metal or plastic that make interesting sounds. Please also bring a cushion to sit on, a warm blanket and some lunch to share. The ninth in our series of arts evenings, bringing 'uncut performance gems' (ours and others') into the spotlight. In this workshop we will explore the relationship between sound and movement within the context of Butoh dance. One-day workshop: Music on the edge of silence... movement on the edge of stillness. Exploring sound for butoh. £35 in advance, £45 on the door. This is the fourth in the continuing series of inspiring workshops co-led by musician Adrian Freedman, and Jeannie Donald-McKim. As previously, this workshop is open to all dancers and musicians, of whatever level of experience, who are interested in investigating the territory where sound and movement interweave. Participants of the past three workshops have discovered a heightened sensivity to both sound-making and movement, a raised awareness of the rising impetus to move or make sound, and a corresponding expansion of their moving/sound-making world. There is free space for four people to sleep, bringing their own sleeping bags, on the Friday and Saturday nights. There are also excellent bed-and-breakfast facilities available locally. The tenth in our series of arts evenings, bringing 'uncut performance gems' (ours and others') into the spotlight. Cafe Reason will be performing a short piece as part of Oxford's monthly 'Playground' event at the Old Fire Station, Gloucester Green, Oxford. Free admission. See the Playground web site for further details.